...Getting blokes to say how they are feeling. 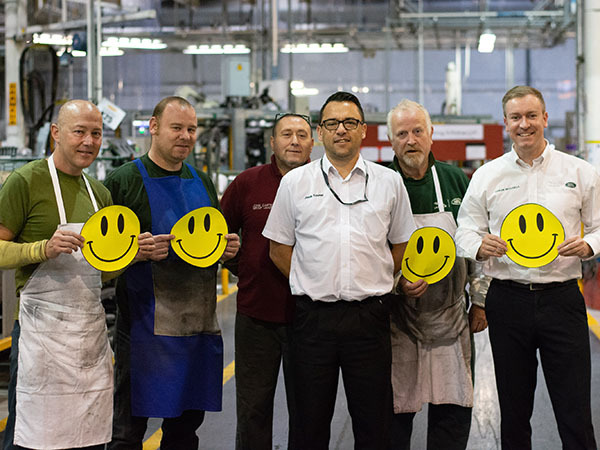 John Carter and the Underbody team in XJ Body-In-White have been running an emoji ‘frame of mind board’ in their area since March earlier this year and the difference it has made in the area has been massive. Most guys say that we’d be there for a mate who needs us, which is great. The problem is that most of us also tend to say that we feel uncomfortable about opening up to ask for help. It doesn’t take a genius to realise that these two things simply don’t add up. It can’t be right that we keep missing the opportunity to make ourselves better because we find it awkward to reach out to our mates who are more than willing to help out. One in eight men in the UK experience a mental health problem that can manifest in a range of ways from anxiety and stress through to anger issues. At the sharp end of this is the shocking but perhaps not surprising statistic showing that 75% of suicides are committed by men. Being able to open up, letting people help or blowing off steam can make a huge difference and goes a long way to preventing or managing mental health issues before they become an issue. It’s all about starting conversations, which is often the hardest bit, but at the end of the day when it comes down to it, talking is one of the most powerful tools out there, it can even save lives, fact. The seeds of this particular idea were laid when MP&L Launch’s Jason Towner joined the ‘Get In The Know’ programme and spent time working in the area with John and the team. “After my placement in C Block I joined a Team Improvement Circle and we were looking for a project that could make a difference. We’d had a couple of non-starters but then I remembered an article we’d read in People Talk magazine where Dan Biggs had shared his story about his mental health experience, coincidentally at the time Radio 1 D.J. Greg James had just completed a charity challenge to raise awareness of mental health. So inspired by those stories we decided to look into ways of improving mental wellbeing at work. “We thought if we could come up with a project that was able to help just one of our colleagues who was having issues then as far as we were concerned it would be a huge success. The great part about TIC is that it gives you a really structured way to look at things and gets you to the root cause of the problem, we were able to narrow most things down to there being no easy outlet for people to say how they were feeling. The TIC team, who by that point had taken on the Emo-Gents moniker, approached John to see if he could trial it out in his area because of the good relationship they had built with him during his Jason’s placement. “Jason and Aaron came to us wanting to improve the wellbeing of the guys in the area by using a board to help people show what kind of mood they were in, the idea being to use it to begin conversations and help communication between the team,” said John as he picks up the story. The initial problem with people thinking of it as a complaints board soon resolved itself as the team learnt that the best way to get the most out of the board was to reflect on how they were feeling internally. “It is such a simple solution, but it really does prompt conversations that as a busy Group Leader you may not have picked up on,” continued John. “Everyone’s name goes on the board and at the start of shift and they can move their name to whichever emoji column best reflects their mood. It is an easy thing to do and doesn’t feel as big a deal as raising an issue with someone. “It has obviously worked differently for individuals in the team, but I can definitely see a marked improvement in how everyone interacts with each other in the area. “One particular guy used to get more and more progressively frustrated throughout the day until he got to the point where everything would boil over and he’d suddenly unleash these frustrations on anyone within earshot. “We soon found out that this would happen because he didn’t feel like he was being listened to. Now throughout the day he’ll often move his name into the angry emoji section but that allows me to realise there’s an issue and go and check in with him and now him and everyone around him seems much happier. These are just two of many examples John mentioned amongst many others of how the emoji boards had made a difference to moral in the area. Having used them for a few months he says there is no way he’d stop using them. Congratulations to the team for putting in the effort to engage with the idea and keep the momentum going with it. John has since welcomed in colleagues from other blocks who are keen to try out emoji boards in their areas too.